From our family to yours, I would like to extend a heartfelt thank you for supporting local food and farms. With more factory, mono cropping farms and huge corporations taking over food supplies, it’s more important than ever to support small farms. We hope your new year is filled with health, happiness and delicious, nutritious vegetables. Wishing you the very best and more for 2014. There are tons of studies that support the theory that plant based lifestyles are the best and most sustainable way of losing weight and improving health. There is no better study than trying it out yourself and reaping the benefits of total body improvements. I recommend watching a cool documentary called Forks Over Knifes which goes into much more details. When you get your box this new year make a conscious effort to eat every vegetable inside. Your body will thank you. Instead of saying, “I want to lose weight this year”, try adjusting that to “I want to focus on the quality of food I put in my mouth,” and the rest will follow. This entry was posted in Uncategorized on December 31, 2013 by Carolyn. Happiest holidays from all of here at the farm (including the chickens). Please note we are shutting everything down next week. There will be no boxes prepared on December 25th. We will also be suspending deliveries to all schools December 25th & January 1st. Because of the shorter days and colder nights things have really slowed down here on the farm and things are growing a lot slower. It will be nice to give the farm a week off to regenerate. We are selling gift certificates in 2-12 week increments. The gift card includes a plantable card from Green Field Paper and a $5 gift certificate to our CSA store. Please contact me or check out our website for more details. Your CSA box this week will include a small homemade gift from us girls here at the farm. It only seemed appropriate to bake some cookies! This entry was posted in Uncategorized on December 17, 2013 by Carolyn. For a limited time we are offering gift certificates in any amount from 2-12 week time periods. Your gift will include a plantable card from Green Field paper company and a $5 gift certificate to our CSA store. There is no better present than the gift of veggies and health. We will be closing for the week of Christmas (12/25). It just so happens Christmas lands on Wednesday this year so we will be taking that time to spend with our families and plan for the upcoming year. We are really excited to be on the verge of offering eggs in the CSA. In the new year we plan on partnering up with a brand new mom and pop bakery called Deux offering some of the most spectacular bread I’ve ever seen. Hopefully with eggs, bread and cheese we can keep a lot of our dollars spent locally in the community while nourishing our families. 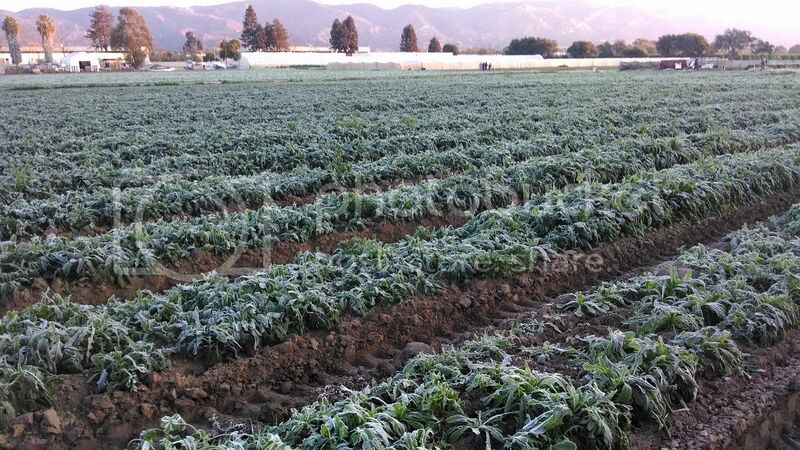 It’s been below freezing here on the farm and we are definitely feeling as winter as Santa Barbara gets – about 29 degrees. Here’s some frozen dandelion greens this morning: No more zucchini and I am betting that tomatoes are going to be hard to find in the next few months, so let’s especially enjoy them this week. I am looking forward to a few new winter crops trickling in! This entry was posted in Uncategorized on December 10, 2013 by Carolyn. For the month of December we will be offering gift certificates anywhere from 2-12 week periods. If you are interested please contact me or visit our website. All gift certificates come with a Season’s greetings, handmade, plantable card from Green Field Paper Company. Each gift will also come with a $5 extra credit to our CSA store. Did you know our Juice Feast blog is below? Follow along and add major health and wellness benefits to your life. Have extra vegetables at the end of the week? Juice em! This entry was posted in Uncategorized on December 3, 2013 by Carolyn.